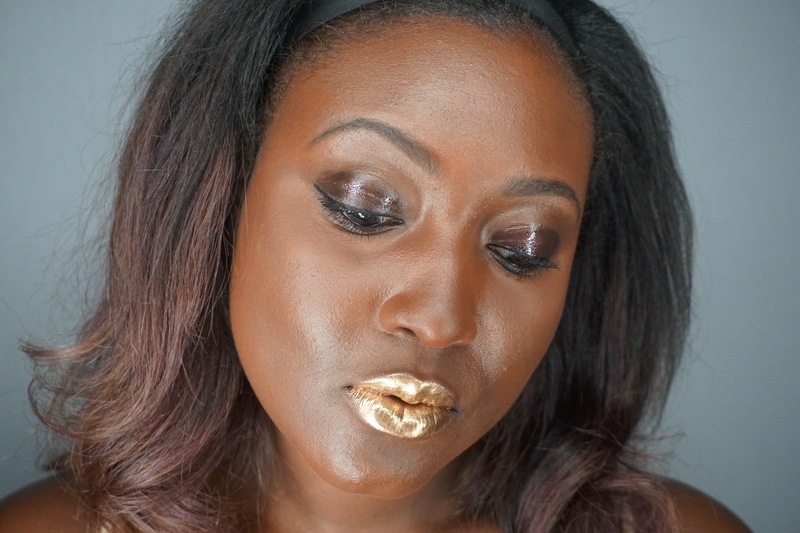 I’ve been craving a liquid, metallic gold lip for the fall and winter. Created from the Bloodwine Lust 004 collection by Pat McGrath, this gooey metallic gold lipgloss isn’t as scary to re-create as it may seem. A two-step process is all it took. Using the gloss from the lipstick kit and mixing in the gold pigment, you’ll birth a smooth, intense metallic gold gloss that’s easy to apply. Just don’t plan on kissing anyone. Or eating. My favorite part of creating this lip look was the fact that most of it was done with my hands. There was no conturing, no intense blending, nothing over the top. I remembered just how simple bold makeup can be. -Create an even face with your favorite foundation. I used my hands to apply CoverFX’s Oil Free Foundation in N110. -Tightline your lids with a good liquid liner. I used L’Oreal’s 24HR Infallible Super Slim liner. -Go barely there with your eye shadow. I used a brown shadow by Make Up For Ever and, using a flat brush, added Pat McGrath’s Lust 004 gloss on top for that runway look. -Go extra bare with blush. I dusted TopShop’s Chameleon Highlighter in Mother of Pearl on the apples of my cheeks, up to my temple. -Add a translucent powder if you want to look matte. I purposely didn’t mattify my skin, but of course, it’s your choice.